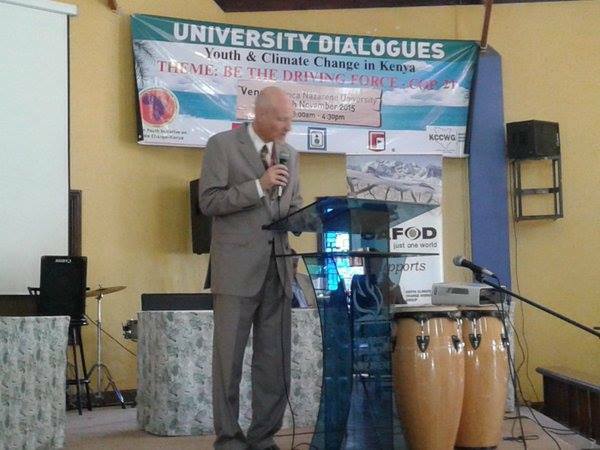 On November 20th, 2015, 80 participants gathered at the Africa Nazarene University in Nairobi, Kenya. The morning started off with a warm welcome on behalf of the Vice Chancellor of the Africa Nazarene University read his speech here, followed by Mr. John Kioli, Chair of the KCCWG and Dr. Richard Lesiyampe, from the Ministry of Environment, Water and Natural Resources. The audience could then listen to Kenya’s Progress in addressing Climate Change and its position for the upcoming COP21 in Paris. This was presented by Mr. Stephen Kinguyu from the Ministry of Environment, Natural Resources and Rural Development Authorities. This enthusiastic session was followed by and address by the UNEP’s Mr Waiganjo Njoroge. Mr. Njoroge spoke about the link between youth and climate change and what we should do about it. See Kenya’s position presentation here. Moreover, find the presentation on policy here. After a short break, the audience was excited to hear from Mr. Paul Mbole, Chair of the Sustainable Energy Network. The audience enjoyed a Q&A session with Mr. Mbole, likewise. A panel discussion followed the brief interaction composed of Ms. Cecilia Kibe from the KCJWC, Anita Negri who is currently President of oikos, Mr. Kevin Kinusu from TechforTrade, East Africa and Mr. John Kioli from KCCWG. 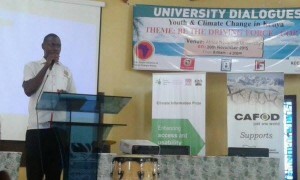 The panel addressed several topics amongst which were gender roles in climate change, opportunities within the agricultural sector, plans for COP21, how to fund climate projects and responsible leadership amongst youth. See the presentation on agriculture here. After a short lunch break, it was time for break out session in which groups discussed and exchange opinions on three topics: climate finance, energy and agriculture. After the presentation of what each had exchanged in their groups, moderated by students, participants had the opportunity to plan trees, guided by John Henry. The programme closed with a lot of inspiration on thinking to be done on behalf of participants after the various inputs heard throughout the day. Specials thanks go out to John Henry who made a lot of efforts in organizing this event. May this serve as an example for many more such events to come. See how the hashtag on Twitter got people talking here. And on Facebook here. 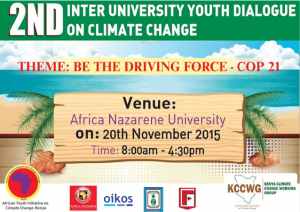 Kenyan Universities represented: Africa Nazarene University,Technical University of Kenya, University of Kabianga, Multimedia University of Kenya, Jomo Kenyatta University of Agriculture and technology, Mount Kenya University, Kenya Climate Change Working Group, African Youth Initiative Against Climate Change, Daystar University Kenya, Miss Tourism Kenya , Ministry of Environment.